Lewisville, Texas (November 30, 2018) - Fairview Microwave Inc., a leading provider of on-demand RF and microwave components, has recently expanded their line of RF coaxial probes into the 40 GHz frequency range for use in high-speed communications, microwave components and networking applications. Fairview Microwave's expanded line of coaxial RF probes now includes four models that deliver 10 dB maximum return loss over a broad frequency range of DC-40 GHz. 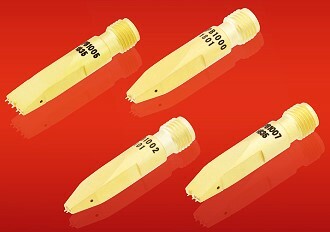 These new RF probes are offered in GS and GSG configurations with a pitch of 800 or 1500 microns and a 2.92mm interface; they are gold-plated and feature compliant pogo pin contacts that allow for a wide range of probing angles. These coaxial probes can be used by hand, with or without a probe positioner, and can be cable mounted or mounted with Fairview's multi-axis probe positioner. These coaxial RF probes are ideal for signal integrity measurement, coplanar waveguide, chip evaluation, substrate characterization, Gigabit SERDES and test fixture applications. "The extended 40 GHz frequency range of our new GS and GSG probes allow RF technicians and engineers to cover a wide range of applications, including 28 Gbps data channels," said Dan Birch, Product Manager. Fairview Microwave's expanded line of coaxial RF probes are in stock and ready for immediate shipment with no minimum order quantity.